Darlings, you know me for my love of skinny jeans. It seems that every morning I awake with the goal of donning something other than denim, but the luxurious feeling that such fibers instantly proffer to the wearer always lures me back in. As an adorer of all things fashion, of course, I have always maintained a rule…the jeans being worn must be sophisticated, classy, and playful all at once; whilst being comfortable enough for me to feel cozy through and through. Hence the reason why I jumped for joy when Marisa of Citizens of Humanity invited me to be a part of a “denim experiment,” and sent me a pair of Avedon Skinny Legging Jeans in the rustic Dust wash. Having never tried denim leggings myself, I truly had no idea what to expect; but I was thrilled to be a part of such a fun project. Unfortunately for me kitty cats, it was an absolute disaster – at least for my wallet; for within minutes of slipping them on I was head over heels in love with not only the aesthetic, but the resilience they provided, leading me to believe that I will be scooping up many more pairs in the very near future. Thanks to le sister Tiffany - my photographer - for the pictures. I love the empire waist! very hot boots! You look adorable! And chic and comfy all at the same time. those jeans look beautiful on you ! Oh my goodness! 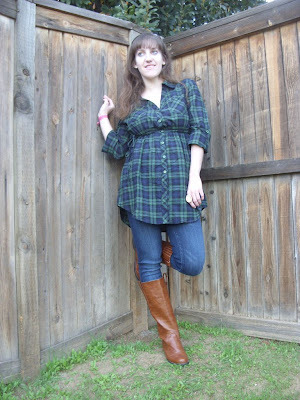 Your very first outfit post! I love jeggings and am glad you do, too :). In fact, I'm wearing a black-wash pair at the moment! Erika, I love this outfit post... the jeans looks great on you. I'm also a jeans addict myself...and I love the skinny ones. Love the skinnies and those fabulous boots too! Okay, I must first say I LOVE the boots the color is amazing. Now to the jeans they are super cute I am a skinny jean addict so these are right up my alley. What a super Casual-Chic Outfit Erika!! You have such a fab boot collection - wow!! love seeing your face! The jeans are splendid and great on you!! I'm not a fan of jeans leggings, but these look cute! I could have sworn they were normal jeans jugding by the pics... you look great! Those look SO comfy!! I just wish that "jeggings" were more affordable! 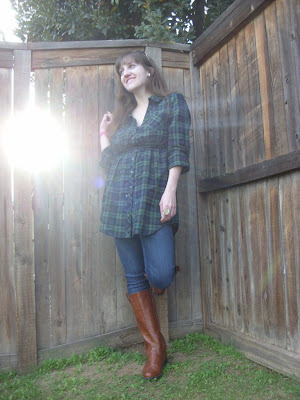 I love this outfit post, Erika! Anyway, you look fabulous in your outfit! The legging jeans look great and I'm sure they're quite comfortable. Loving the boots as well! I wont wear anything else! which annoys the heck out of my friends but I really don't care; the jeans are too comfy. Oooooh, its so good to see a picture of you in a post! You look so beautiful! The jean leggings do look really good on you. I may have to get myself a pair as well. I absolutely love my denim as well! You are so fricken cute!!! This is my first glimpse of your pretty face - you look wonderful! You look so cute! Love the boots! Very cute jeans - especially with the boots! Great winter look! I have nothing but skinny jeans in my closet which kind of limits my versatility when it comes to denim, but I can't live without them! Fabulous post! My daughter gave me denim leggings and equestrian boots for Christmas, they totally rock. I love that the look is so different from what denim's been the past few years, with the boot cut. It's a great change. ah, denim leggings are wonderful! And they look great on you, especially paired with those boots. so cute in your outfit shots! denim leggings are my absolute favorite clothing item lately. i've been literally living in mine lately because they slip into my boots so effortlessly. these citizens are gorge! Aww, I love that you're sharing photos of yourself now. You're gorgeous, girl! And I adore your bangs. 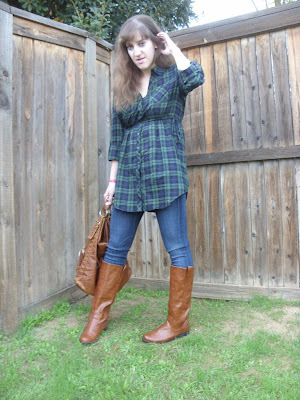 Love how you styled the jeans...and I covet your boots. What is going on, I am soooo confused. 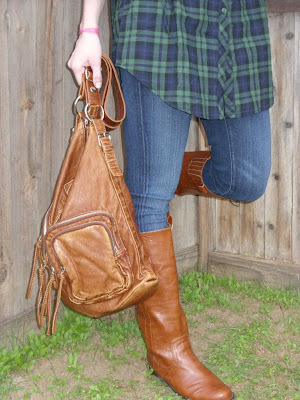 You look great in them...and the boots go so well with the purse and the jean leggings! You have the legs for them...me on the other hand...not so much! :) Thats awesome that they asked you to be part of the project! i looove those jeans! i love citizen jeans! you look absolutely fab!!! so jealous you got to be part of such a fun project! tell more!!! tbey look great on you! i invested in a pair of very expensive theory leggings that resemble black skinny jeans... so much more comfy! and i love the back "pockets" to make them look even more real! So exciting to finally put a face to the blogger! Hehe aren't denim leggings awesome? Welcome to the cult! oh fun! denim leggings are pretty much the only pants i'll wear so i'm always on the look out for new ones. also i'm loving that we get to see you! At last we see you! You should ALWAYS wear skinnies ... you make them look uber rad with the touches of brown! Just lovely! Darling, I am in love with your rule: "the jeans being worn must be sophisticated, classy, and playful all at once; whilst being comfortable enough for me to feel cozy through and through." I think that is an amazing quote to always keep in mind when shopping for jeans!! I have actually seen some skinny legging jeans at a store here in Rome, what a unique and fun idea!!! Those boots are absolutely perfect. I've yet to try the layering look with jeans, but I think I might! oh, you're such a pretty girl! Lucky lady you got those jeans! They look fab on you. And I love the brown accents with the boots and bag. You look great! you are so pretty, and look fantastic. Those denim leggings are AMAZING! I've never really loved the idea of "jeggings" but these look and sound fantastic. Adorable! absolutely adore your outfit! you look so cute! ps: i absolutely adore denim leggings! oh and darling, jolt has some awesome ones too! and they're pretty budget friendly! U are so perfect, darling E! I'm a huge fan of plaid. hihi! they are great...i too, am a fan of the skinny jean! These are cuter than I would have expected. I just can't get past memories of the 80s with the leggings and adding denim to the description sent shivers down my spine. But I retract that. They're cute on you! Skinnies are so wonderful, aren't they? You look lovely darling! And I have a bag in that shade of brown too.All in all, a totally rocking outfit post!